Creamy green bean casserole made with dairy-free, whole food alternatives. Lighten up Holiday meals with this tasty, plant-based alternative. The cashew cream version is pictures above, It is a lighter, thinner cream sauce. The bean version is pictured above. It is thicker like mashed potatoes! 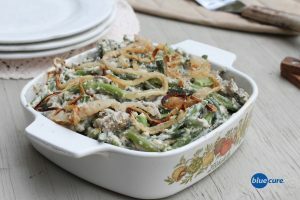 Both options are great alternative to standard green bean casserole recipes. The cashew version will provide more healthy fats, while the bean version will provide more healthy proteins. If using fresh green beans, wash and trim the edges. Boil the beans until tender. If using frozen, thaw the green beans. Heat the oven to 400F. Slice the onion into thin circles and place on a pan with parchment paper. Roast the onions until desired texture, note: they will continue to cook when cooking the casserole at the end step so avoid over roasting. For version 1, combine the beans, garlic, water, salt and pepper in a blender and blend until smooth and creamy. For version 2, combine the cashews, garlic, salt, and pepper and blend until smooth. Adjust water as needed for thinning, but the mixture should be fairly thick. It will thicken overnight, so if you prepare this ahead of time. In a large pan, saute the mushrooms in a small amount of water. Then add in the cream sauce from step 3. Lightly cook over low-medium heat. Then add in the green beans. 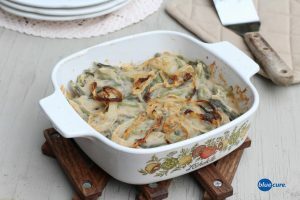 Place the mixture into a baking dish and then top with the onions. Bake for 15 minutes at 350F.